A great power tool collection can be an asset to any homeowner, or professional working out on the job site. There are lots of options for cordless nail guns, and the options are getting more powerful, as well as more affordable. Each one has different features, and it is important to determine which options you prefer. Here are a few reviews to help you start your search for the Best Cordless Brad Nailer for your needs. Weight: The heavier the nail gun, the more powerful, but the harder it is to work with overhead projects. Adjustable Modes: Some nail guns can be put in either ‘bump mode’ which just bumps the nail head to fire, or ‘time mode’ which can be set to fire nails at regular intervals. Angled: These nail guns are great for getting nails in hard to reach spaces, or for trim work. 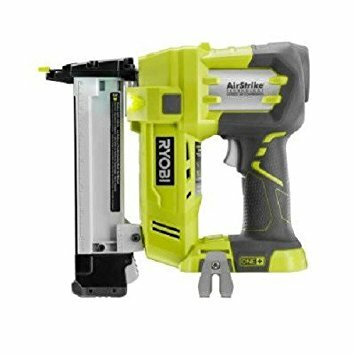 The Ryobi ZRP320 18V ONE System is a great example of how easy a cordless nail gun is to use. It is an eighteen gauge brad nailer with AirStrike Technology that gets rid of using a noisy compressor. Without needing bulky hoses, or pricey gas cartridges, you can get your work station set up faster, and maneuver around the job site a lot easier. Trim jobs are a breeze with 1,000 nails per charge when you use the enhanced P108 4Ah High Capacity LITHIUM+™ battery along with the Ryobi ZRP320. The Ryobi ZRP320 is a high-quality product for a great price. The Ryobi ZRP320 has an adjustable drive that allows you to change from single fire to contact actuation. This versatility helps to protect your work surface, and helps your nail set up properly. Once the magazine is empty, the dry fire lockout engages keeping you from continuing to fire. 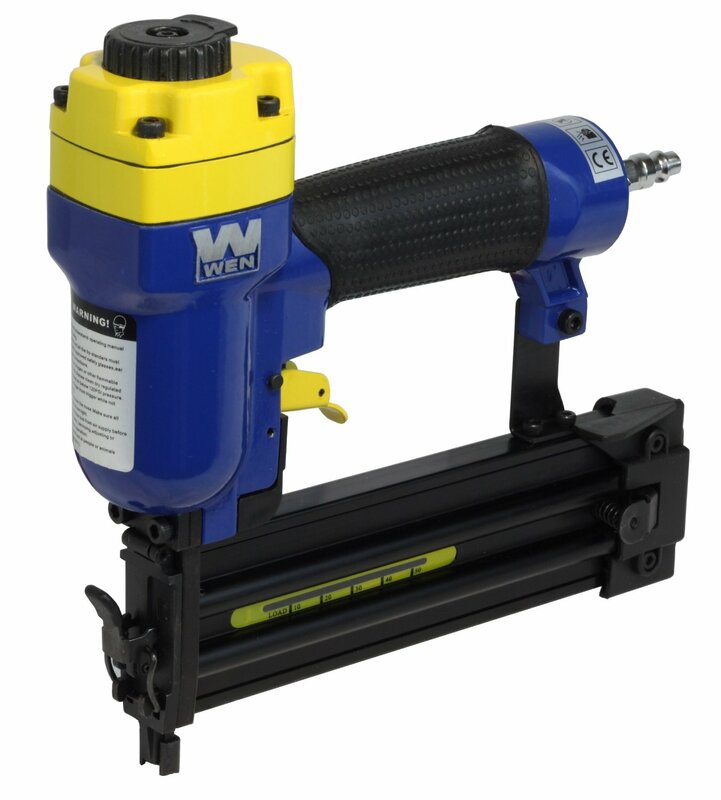 Its known as the “no hassle nailer” and is an easy piece to place nails precisely. 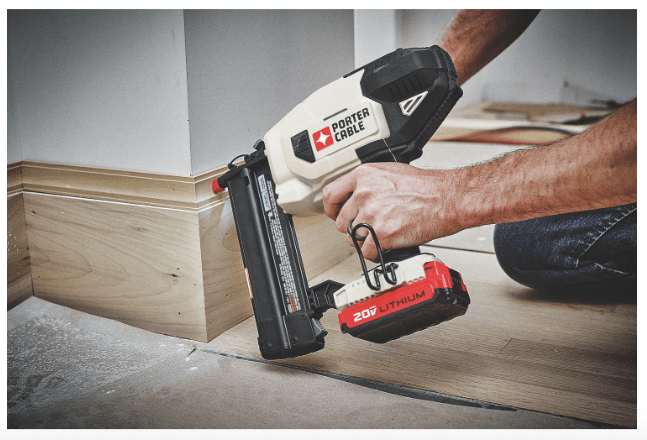 The PORTER-CABLE PCC790LA 20V MAX Lithium 18GA Brad Nailer Kit works completely on battery power which removes the need for a loud compressor. It has a specially designed motor that gives you consistent firing power with several different types of materials, and in a variety of climate conditions. It’s consistency of driving depth lets you countersink nail properly, and a jam release, a tool-free release lever, and a depth adjustment helps to make your work easier. The PORTER-CABLE PCC790LA provides users with convenience and efficiency. The PORTER-CABLE PCC790LA has several tool free settings that makes the nailer very versatile, and helps to increase your productivity as well as your safety including a sequential firing mode and trigger lock. It is lightweight with an optimal center of gravity that offers user comfort while in different positions to reduce user fatigue. The PORTER-CABLE PCC790LA has a multi-functional dual LED light that will illuminate your work area, and a magazine capacity of 100 nails. It also includes a 1.5 Ah 20V MAX Lithium-ion battery that lasts longer than NiCad, and a charger. 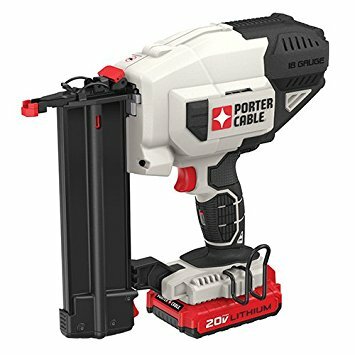 The PORTER CABLE PCC790LA is the perfect nailer for on the job-site and for do-it-yourselfers. 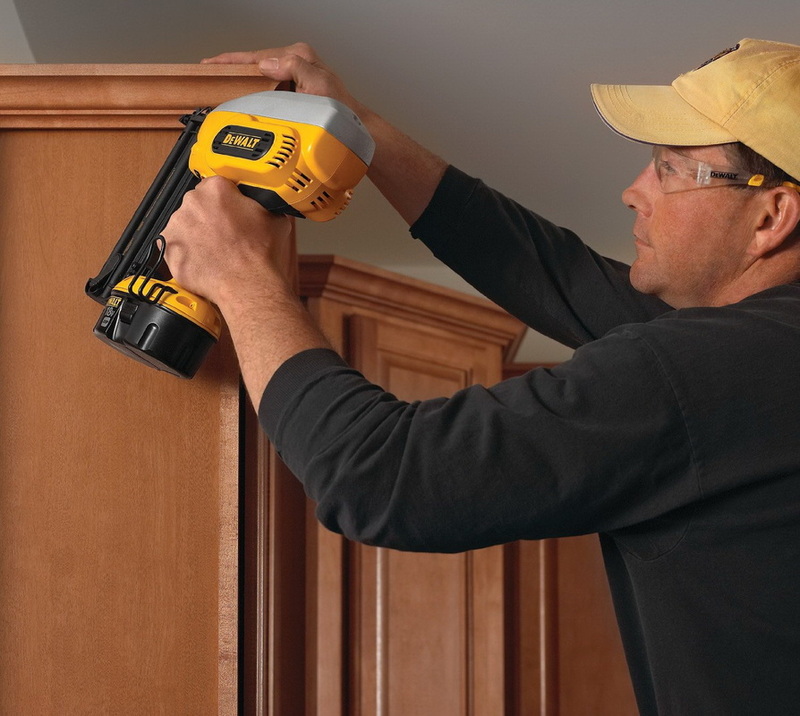 The DEWALT DC608K 18-Volt 18-Gauge 2-Inch Brad Nailer Kit is a high-quality tool that gives fast, consistent results. It includes a sequential operating mode that allows you to precisely place nails, and includes a bump mode to control speed production. 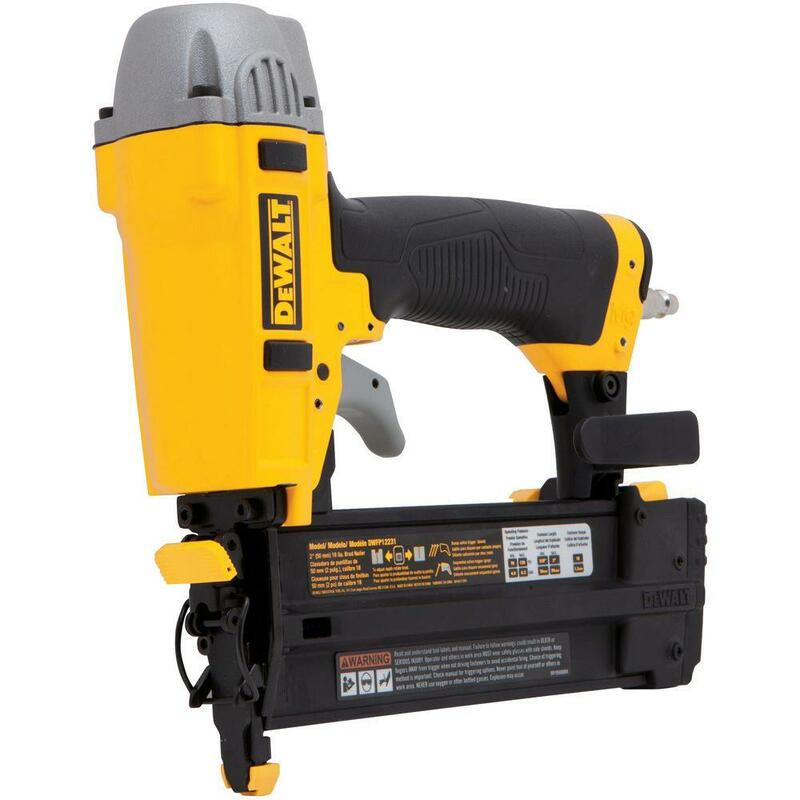 The DEWALT was able to integrate the ease and speed of a pneumatic nailer with the precision that comes from hand nailing with this portable and compact tool. It’s capable of driving brads 5/8 inch to two inches as quickly as five brads per second. The specially designed engine lets the tool work quickly by consistently penetrating nails into hard and soft joints. The magazine will hold up to 110 brads with its box-like style, and was specifically designed to keep out dust that can cause the tool to stop working. It can shoot nails through many types of materials, and it is a great tool for professionals including cabinetmakers and trip carpenters. It’s also great on the job site making easy work of shoe, crown and chair rail moldings, baseboards, paneling, and door and window casings. It has a tapered and narrow nose that works well in small spaces like the inside of cabinets. There are two operating modes for either sequential firing, or high-speed bump firing to make quick work of your projects. It also includes a safety contact lock that will disable the trigger, a precision depth control mechanism, a reversible belt hook, and a swing-open nosepiece that clear jams. This kit includes an 18-volt XRP NiCad battery, one-hour charger, safety glasses, reversible belt hook, and plastic storage case. The DEWALT DWFP12231 18 gauge, 2-Inch Brad Nailer Kit was designed to drive 18 gauge nails from 5/8″ to 2″ in length, and is a great addition to anyone’s tool chest. It has a lot of awesome features including a motor that is maintenance-free promising a long life to your brad nailer. It has a strong, but lightweight design due to its magnesium body. It comes with an adjustment feature that is tool-free, a depth-of-drive that allows you to set nail heads properly, and a tool-free jam release so that you can easily remove nails. To keep contaminants away from your work area, the DEWALT DWFP12231 features a rear exhaust. It also has a sequential style trigger with a magazine capacity of 100 nails. This brad nailer has a nose tip that is removable, and non-marring, plus a rubber, anti-slip grip that improves the user’s comfort during long term use. The DEWALT DWFP12231 is really easy to use, and helps with the speed of your projects. The WEN 18-Gauge Brad Nailer is designed to drive brads from 3/4 to 2 inches in size quickly and effortlessly. It has a three-pound aluminum body that is lightweight and comfortable to use with its rubber-grip handle. This is an ideal tool for any job site since all you have to do is plug it and start working. It can work anywhere from 60 to 100 PSI with a 1/4 inch NPT air inlet fitting. The magazine carries up to 100 brads, and it uses a quick-release design that clears any nail jam easily. Adjustment wrenches, oil, and a custom carrying case are included in the kit making it very portable and easy to carry with you anywhere. It includes a rubber-wrapped handle, exhaust deflector, and a magazine window that will show you how many brads you have left. As a WEN product, it comes with a one year warranty. The WEN is a good product for those that don’t have a lot to spend. Did you enjoy the article? 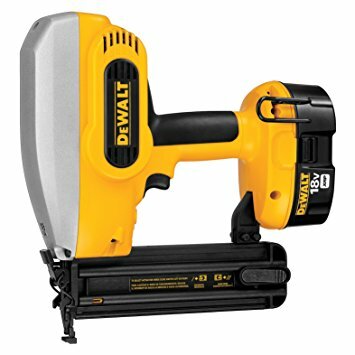 I hope the reviews were helpful in starting your search for the Best Cordless Brad Nailer you can find for your needs. Remember, they all have different features and you need to determine before you go shopping which options will work best for you. It’s a great time to go shopping for a cordless brad nailer as you will definitely find something more powerful and more affordable than previous models. Share the article with your friends and anyone else who is looking to add a great power tool to their collection.